Hiring nanny is a compulsion in today’s generation. With working mom, she needs a third person who can take care of the baby. Especially when she is a single mom, it becomes even more necessary to hire a trustworthy person t take care of the baby. Having a nanny saves the trouble of dropping and picking of baby from daycare. Also the baby stays home with the nanny and grows in the familiar surroundings. Nanny is like the second parent to the child. She knows the needs of the baby and understands every unspoken word of the baby. Hiring a nanny helps you have a flexible schedule. You don’t have to make last minute calls to find a person to take care of your kids. She will be there to stand by your kids when you need her. You don’t have to be guilty of leaving your baby alone. You have a late night meeting or an important office party to attend; you don’t need to have second thoughts. You do not have to worry about packing lunch for your baby. Nanny is going to take care of the food of your child. Imagine you are sick or late from work, now who is going to cook for your kid? You do not have to worry. Nanny must have cooked and may be put the kids into bed according to the kids schedule also. Imagine you have several kids. Now how much would it cost to leave them at daycare? Having a nanny can even cut out on your pockets. She would take care of the kids at the same price as she would charge for one kid. May be a little higher but not definitely as high as a daycare every day. Your children can stick to their own schedule. They need not alter to their timings according to your convenience. They can still maintain their going to bed and waking up timings. They do not have to wait for you to get back from office to take them out to play in the park. Your nanny is along with them to take them. Also you do not have to worry about your kids being out without adult supervision. Working women cannot afford to give complete attention to their kids. It is the truth. With work load, meetings to attend, presentations to complete, it becomes difficult for them to attend their kids always. Hiring a nanny can give your kid a one-on-one concentration. It is going to be consistent and regular attention. You can give your work priority and be productive, contribute to the growth of the company. You do not have to worry about the kids back home because you know they are in safe hands. Minute problems wouldn’t be a hindrance in your work atmosphere. If there is a bad weather, you know your kids are back home safe. You do not have to worry about picking them in this weather from daily care and then worry about driving back home. Also you know there is a constant watch on your kids by an adult, so they wouldn’t do something wrong. Also playing with their own toys at home reduces the transfer off germs unlike the toys at daycare. With you being busy at work, the indiscipline of your kids can go unnoticed. But a nanny will make sure to keep your kids disciplined. A nanny will organize the toys of your kids of course by simultaneously teaching them how to do it. Who could have thought having a nanny can help a woman reduce the stress by almost half. Isn’t it wonderful to know someone actually loves your kid almost as equal as you do! It is actually like a third parent taking care of child. 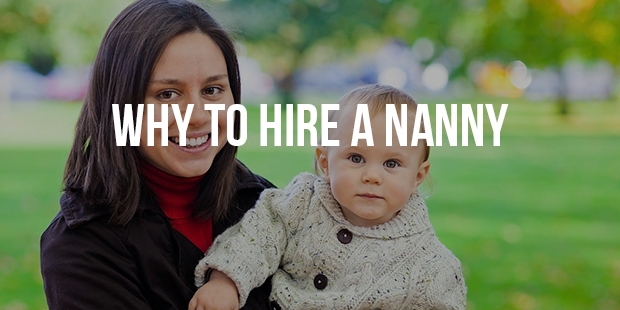 You don’t necessarily have to hire a nanny only for a baby. You have nanny’s who work with a particular family for years making it easier for the kid to adapt to a strangers presence in the house. The bond they share is cherished even after the children have grown up.